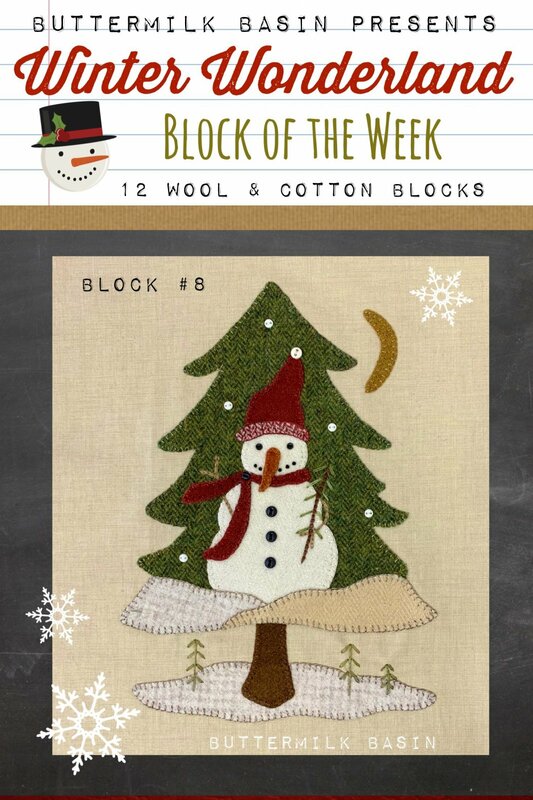 Join Buttermilk Basin's newest block of the week, "Winter Wonderland"! This quilt is 12 wool & cotton blocks, featuring some of Stacy's newest wools and fabrics. 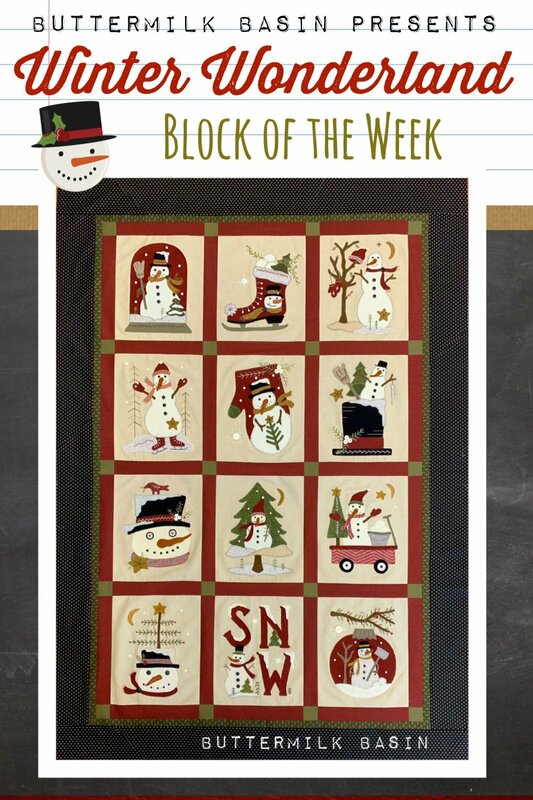 This block of the week runs for 13 weeks, which will be 12 blocks and then the finishing kit. 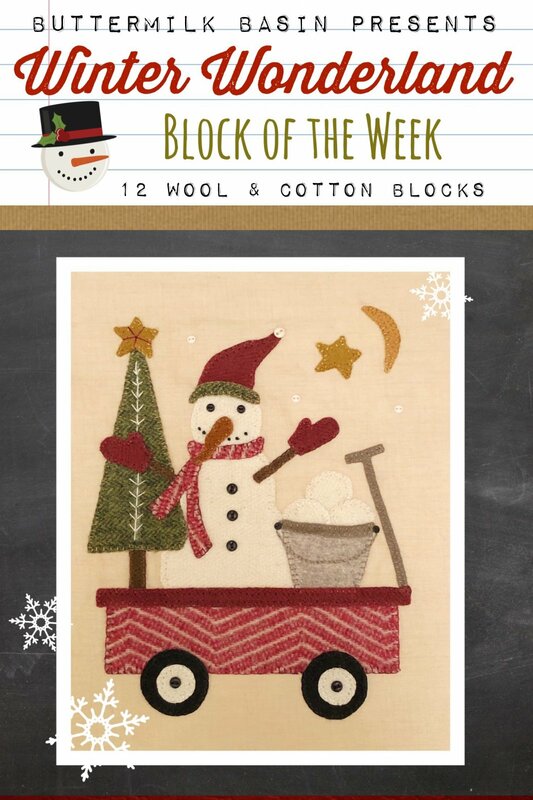 Each kit will include the pattern, wool and fabric background to make that block. You will also be able to purchase a button pack for each block. You can purchase each block online, or call the shop to be put on Autoship! 763-792-0638. View Large Image "Winter Wonderland" Finishing *Kit & Pattern - Pre Order! 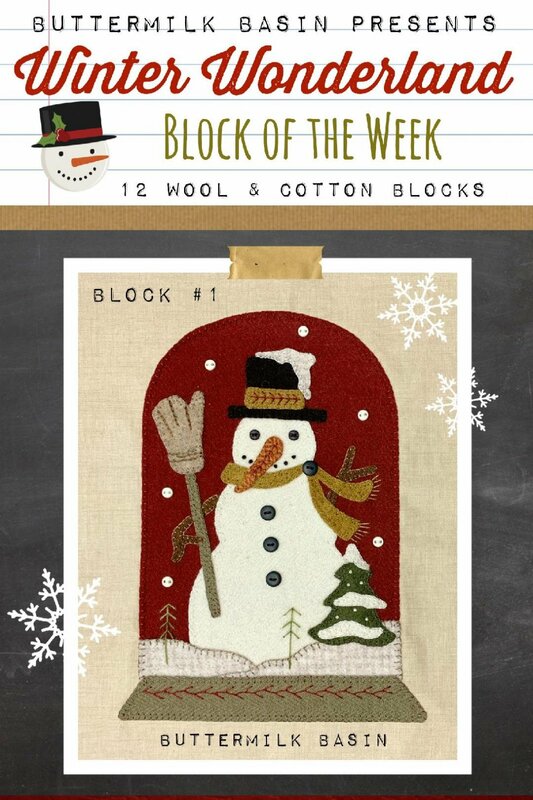 The Winter Wonderland block of the week is complete! The blocks are stunning in this setting, which uses fabrics from Stacy's fabric lines. Please note: The finishing kit will not be ready until May when the last of the fabric arrives. 44" x 63"
This is the button pack for block #1 of the Winter Wonderland BOW. The Winter Wonderland block #2 features a pretty red skate decked out for winter! The kit includes the pattern, wool and fabric background for one block. This is the button pack for the Winter Wonderland Block 2. The Winter Wonderland block #3 features a snowman hanging his hat and mittens out to dry (or freeze)! The kit includes the pattern, wool and fabric background for this block. This is the button pack for the Winter Wonderland block #3. The Winter Wonderland block #4 features Mr. Frosty showing off his moves on his brand new ice skates! The kit includes the pattern, wool and fabric background for this block. 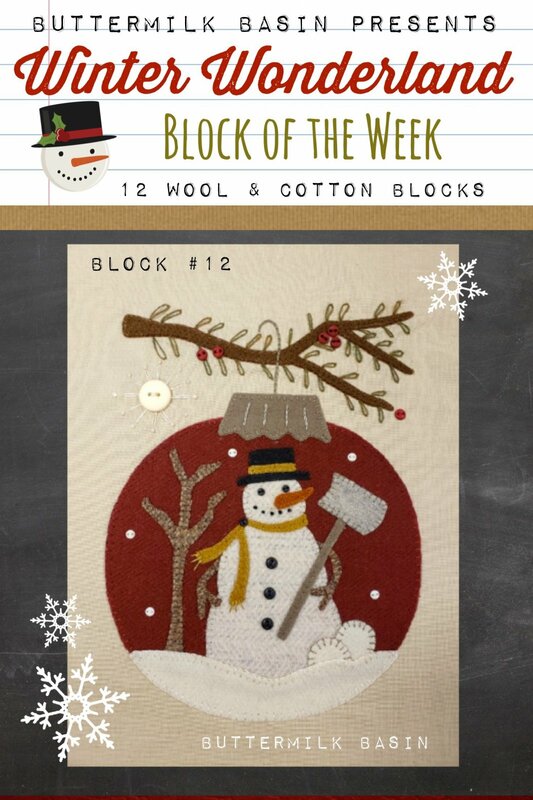 Join Buttermilk Basin's block of the week, "Winter Wonderland"! The blocks will feature some of Stacy's newest line of wool, on a cotton background. 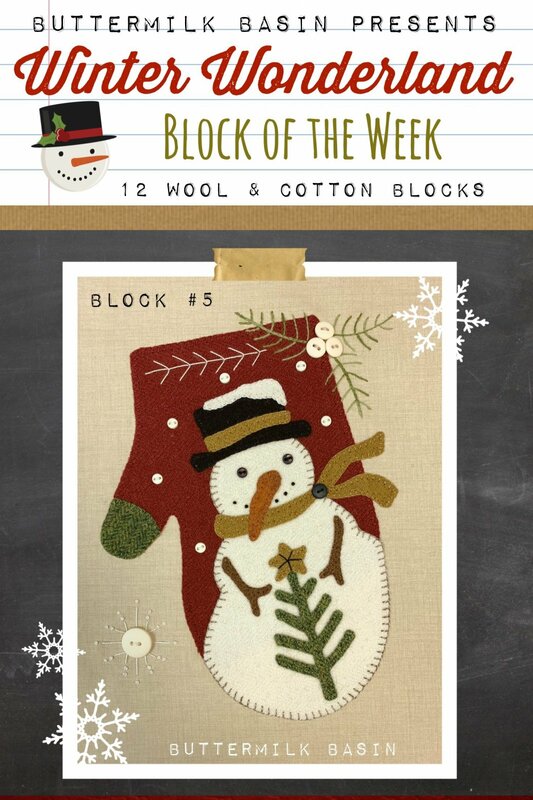 Block #5 is a plump snowman on a gorgeous red mitten! This is the button pack that contains 13 hand dyed buttons to complete block #5 of the Winter Wonderland block of the week. 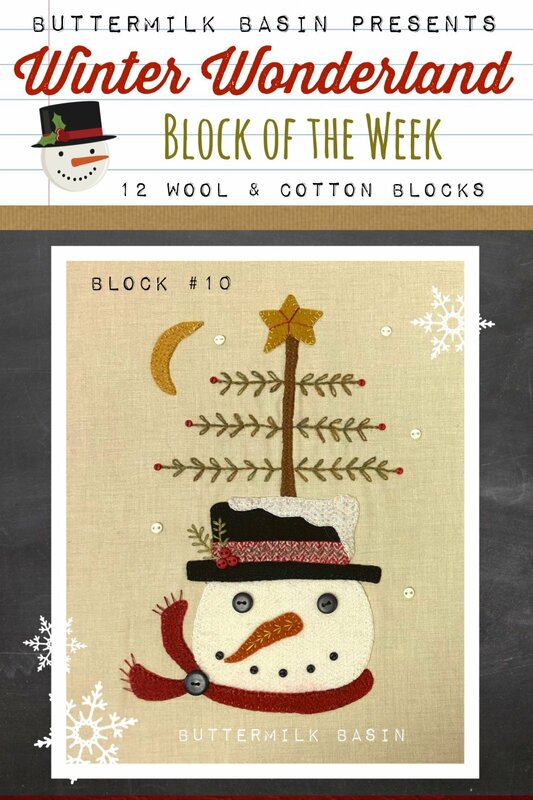 Join Buttermilk Basin's block of the week, "Winter Wonderland"! Block 6 features a snowman popping out of a black hat! The kit includes the pattern, wool and fabric background. This is the button pack that includes the hand dyed buttons used on block 6. 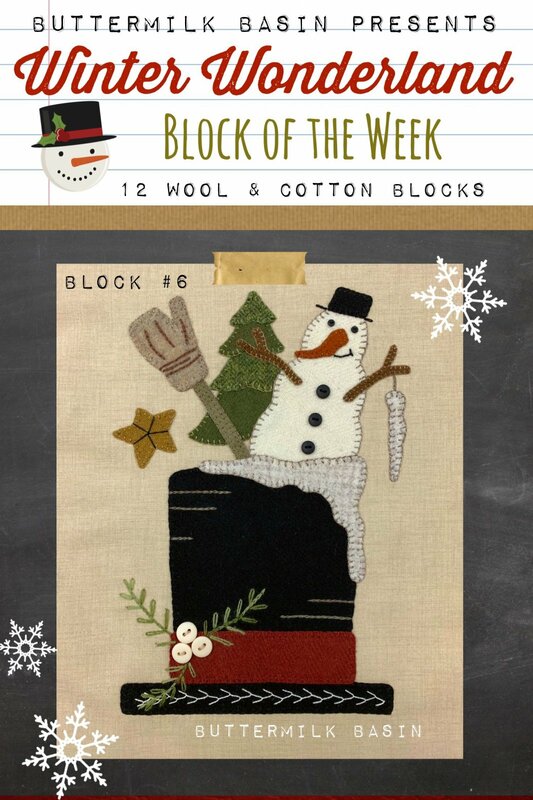 Join Buttermilk Basin's block of the week, "Winter Wonderland"! 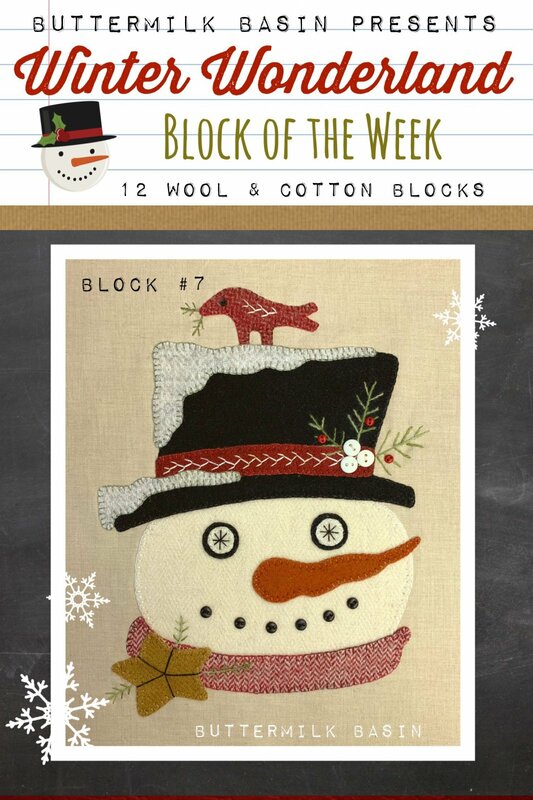 Block 7 features a snowman with a pretty red bird perched on his hat! The kit includes the pattern, wool and fabric background. This is the button pack that contains all of the hand dyed button used to embellish block #7. 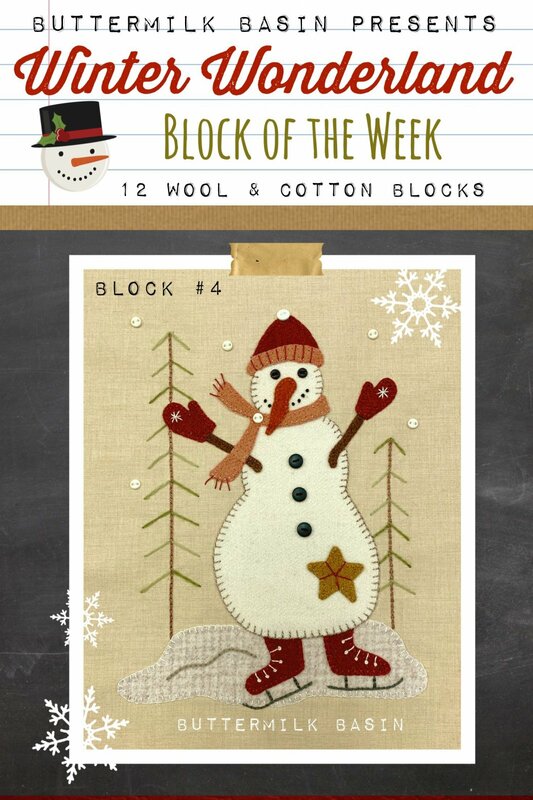 Join Buttermilk Basin's block of the week, "Winter Wonderland"! Block 8 features a snowman in front of a pretty green tree! The kit includes the pattern, wool and fabric background. This is the button pack that contains the hand dyed buttons use on block 8. 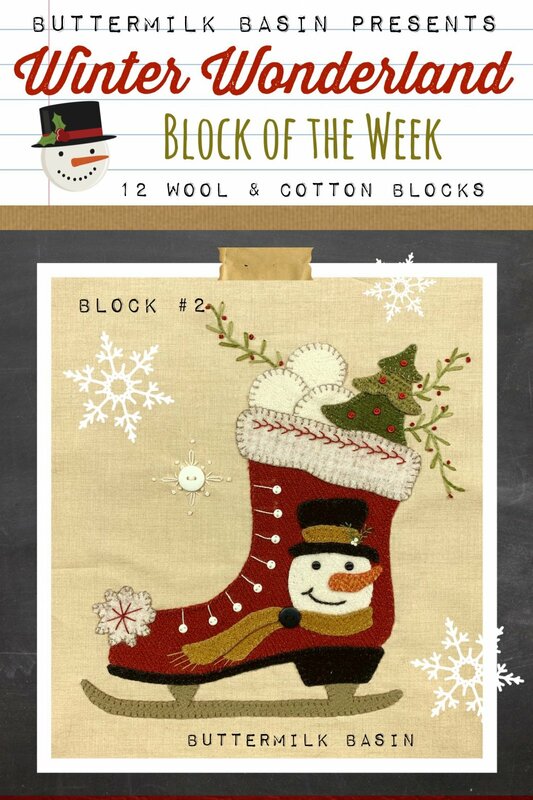 Join Buttermilk Basin's block of the week, "Winter Wonderland"! The blocks feature some of Stacy's new line of wool, on a cotton background. The kit includes the pattern, wool, and fabric background for this block. This is the button pack that contains all of the hand dyed buttons to embellish block 9. 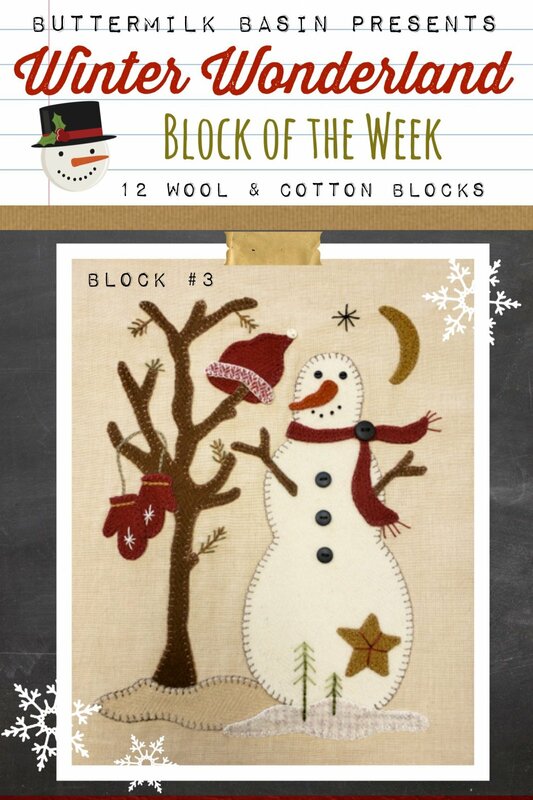 Join Buttermilk Basin's new block of the week, "Winter Wonderland"! The blocks feature some of Stacy's newest line of wool, on a cotton background. The kit includes the pattern, wool, and fabric background. This is the button pack that contains all of the hand dyed buttons to embellish block 10. 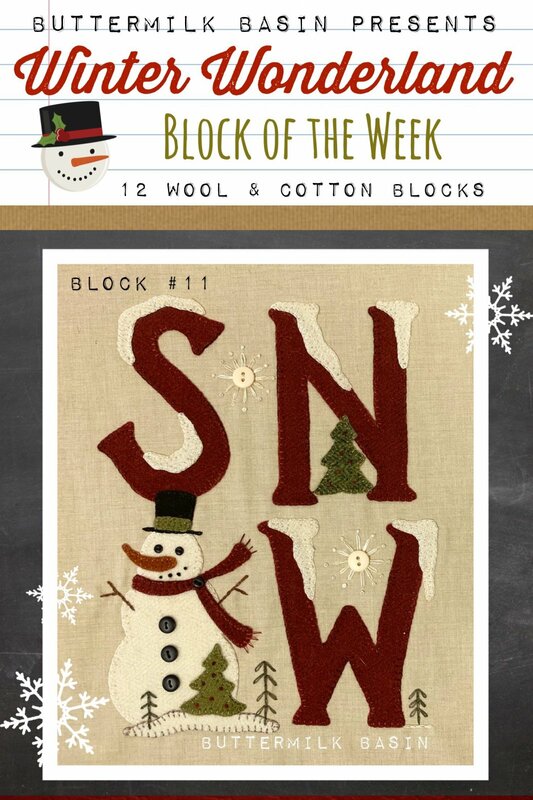 Block #11 spells out SNOW! The kit includes the pattern, wool, and fabric background. Winter Wonderland Block 12! The kit includes the pattern, wool, and fabric background. This is the button pack for block 12 of Winter Wonderland that contains all of the hand dyed buttons to embellish this block. A paperbacked fusible web for hand and machine applique. 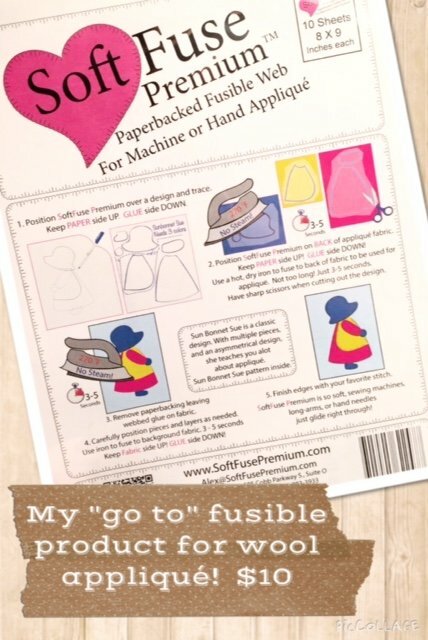 Stacy's "go to" fusible product for wool applique.